Wrecking Ball Interactive –This is the arena that will determine who is King of all your guests. Your energy, your balance, your wit, and your hand eye coordination will all be put to the test. If your party is in need of a true spectacle, look no further than the About to Bounce Wrecking Ball Interactive. As your guests gather around, and you prepare for the showdown, four competitors will climb into the 33 foot diameter Wrecking Ball Interactive Party Rental, and climb atop their corresponding insulated pedestals. By throwing the party safe demo ball, the competitors will attempt to knock each other off their pedestals – eventually leaving one competitor victorious. 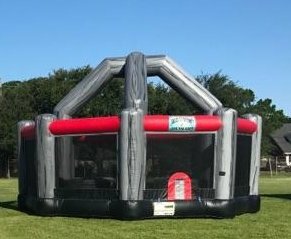 It's a gladiatorial game come to life, in the most party friendly way – whether you have a birthday, special event, or corporate get together. Just one look at the About to Bounce Wrecking Ball Interactive, and there will be no other choice. Priced at $276 for a five hour rental, this is a match and all gray matches with smiles all around.